SCVHistory.com LW2893 | Saugus | Great Saugus Train Robbery: Daybreak, African American Workers, Woman with Baby, Baker Ranch, 11-11-1929. The wreckage of the SPRR West Coast Limited Train No. 59 is seen at daybreak on Nov. 11, 1929, prior to the arrival of the cranes that were used to set the engine, tender and passenger cars back on the tracks behind the Baker Ranch Rodeo grounds (later Saugus Speedway & Swap Meet), seen at upper right. Associated Press wire photo, 8x10 inches. Probably the second AP photograph of the incident that was distributed. In the detail below, note the African-American (and other?) workers with shovels; and the woman holding the baby. The latter might be passengers. "ROAD AGENTS" REVIVE WILD WEST CRIME HISTORY — A leaf from California criminal history of half a century and more ago was taken by train robbers who deliberately derailed a Southern Pacific passenger train, throwing the locomotive and two cars into the ditch near Saugus, Calif., north of Los Angeles. Passengers were robbed of approximately $500. The engineer was injured when the boiler of the overturned locomotive broke and threw scalding water over him. Spikes were removed and the rails expertly loosened without interfering with operation of a block signal nearby, which, if it or its connecting wires had been tampered with, would have flashed a warning and stopped the oncoming train. Photo, taken just at daybreak, shows overturned locomotive, tender and two cars, baggage car and smoker. 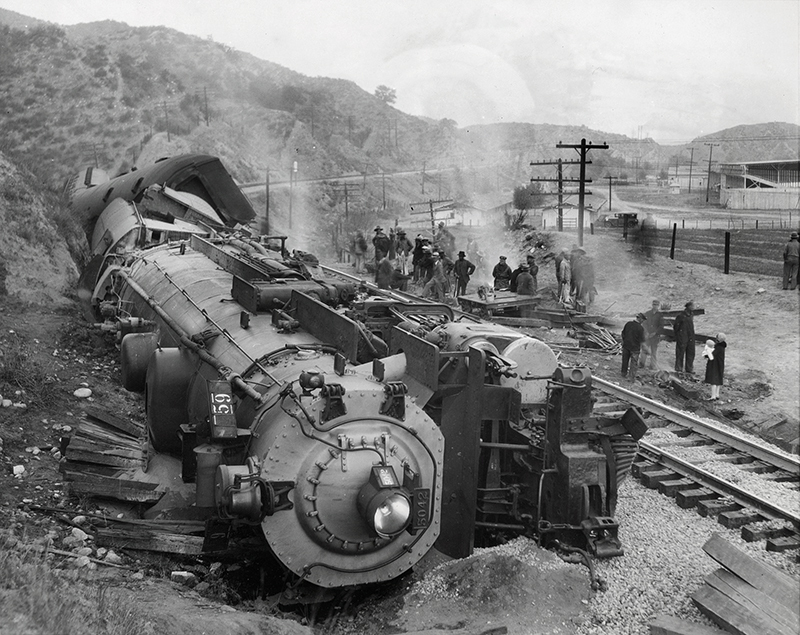 Reminaing cars of train, left on rails, were pulled back to Los Angeles by relief engine. Early reports indicated there were two or more robbers, but only Tom Vernon, alias Tom Averill, was hunted down and tried for the crime. Engineer R.C. Ball was treated at White Memorial Hospital in Baldwin Hills. No other injuries were reported. Engine No. 5042 was one of 10 Class SP-3s. Just two years old at the time it was derailed, the 4-10-2 locomotive was delivered in 1927 with a 160-C-1 tender. The 5042 remained in operation at least until Dec. 7, 1960, when the West Coast Limited made her final run (Serpico 2000:25). Detail from top image. Click to enlarge. According to Santa Clarita Valley historian Jerry Reynolds, Tom Averill, alias Tom Vernon, served time for committing several crimes. 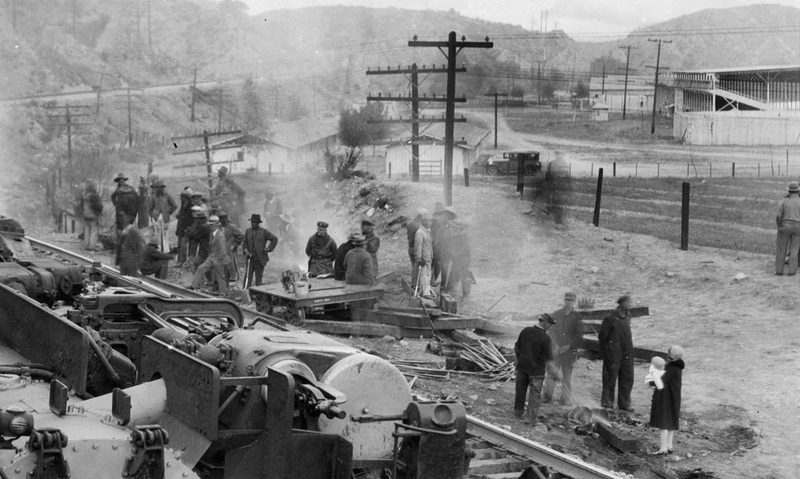 He worked on a Saugus ranch and, after failing to land a job with the Southern Pacific Railroad, decided to derail one of the company's trains and rob its passengers. The most spectacular local robbery occurred during the early evening of Nov. 10, 1929. After pulling into the Saugus Station for water, a massive three-barreled steam locomotive of the 5000 series left at 7:40 p.m., rounding the bend at Bouquet Junction, then starting to gather speed as she headed out Soledad Canyon. Suddenly Engine No. 59 began to lurch violently back and forth. Then, after chewing up 600 yards of track, it crashed over on its side as a torrent of flaming red sparks flew from spinning drivers. The engineer barely escaped being scalded to death as his steamer slid to a halt behind the Saugus Speedway [then the Baker Ranch Stadium]. Somehow the passenger cars remained upright, although there was total panic aboard. Into this bedlam, from out of the clear night, stepped a 5-foot-6-inch man with an air of authority. Quickly he calmed the hysterical women and nervous men, got them back on the Pullmans, and, as soon as everyone settled down, robbed them of all their valuables at the point of a .38-caliber revolver. He then vanished into the inky darkness. 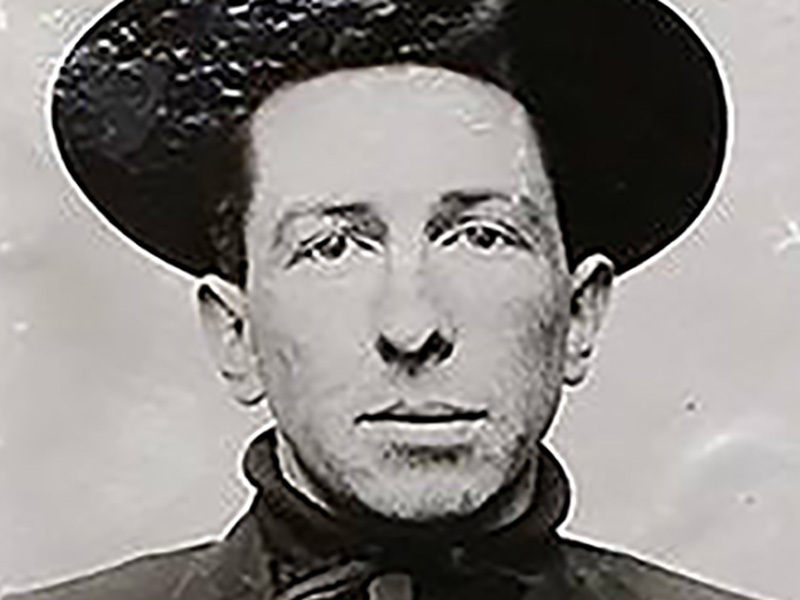 Next on the scene was Deputy Sheriff Jack Pember, who identified the gunman as Thomas E. Vernon, an itinerant cowboy who liked to call himself "Buffalo" Tom [in honor of William F. "Buffalo Bill" Cody]. Pember found that Vernon had broken into the Saugus Yard tool shed, lifting a wrench and spike puller. He then yanked the bolts that held the rails together, settling down in the bushes to see what would develop. After the robbery, which only netted $300, "Buffalo" Tom walked over the low ridge to Wood's Garage, where he hitched a ride down to L.A. with one Thomas Firth of Burbank. Vernon claimed that his nonexistent daughter was injured in a train wreck and paid Firth five dollars for a lift to the Children's Hospital. Two weeks later he derailed another train near Cheyenne, Wyoming, and was plotting a third when he was captured at Pawnee, Oklahoma. Reynolds wrote that Vernon was sentenced Dec. 18, 1929, to life in Folsom Prison and that he was "released 35 years later" — 1964 — "a small, nervous, aged, gray-haired man, who died shortly thereafter of a 'social disease.'" However, this information is in dispute. Carolena Rezendes of Citrus Heights, Calif., writes (Aug. 31, 2004): "I know for a fact that he was Not in prison in 1957/1958 because he was living with my family in Sacramento, California, in 1957 & 1958. As to how he died, it was TB. Our family buried him." LW2893: 9600 dpi jpeg from original photograph purchased 2017 by Leon Worden.